Have you run out of ideas to have a night in Cancun? 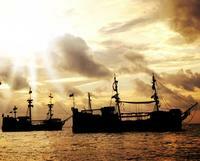 Then, hop aboard the Columbus Galleon and have an incredible time. The live sax melodies and the smooth lagoon fondled by the wind, will make your night one to remember. Admire the views and enjoy a delicious dinner'and drinks'as you sail on the Nichupte Lagoon. Live, love and enjoy one of the most beautiful experiences while in Cancun. Set sail from Cancun on a pirate ship for a family-friendly evening of dining, dancing, and a live show. During this dinner cruise, be entertained by Caribbean pirates as they perform a swashbuckling, sword-fighting, cannon-firing show. Dine from a plentiful'buffet'and indulge in plenty of domestic drinks from the ship's open bar. Menu choices'include a kid's meal and a vegetarian option. Come'aboard the Jolly Roger pirate ship for a family-friendly evening of dining, dancing, and shows. During this 3.5-hour cruise, be entertained by the most most talented pirates in the Caribbean with an original swashbuckling, rope-swinging, cannon-firing show. Dine on a pre-ordered menu served by a pirate waiter and say "bottom's up" to an endless supply of domestic drinks. Menu choices'include a kid's meal, a premium option, and a vegetarian option. One of the most famous night tours in Cancun. It is a tranquil trip through the romantic and calm waters of the Nichupte Lagoon. The trip has been especially planned to share magic moments with that loved person. 'As the sun goes down, the indescribable experience of sailing aboard the'Spanish Galleon Columbus will set your heart on fire to give you a higher meaning and deeper bond with that special someone.